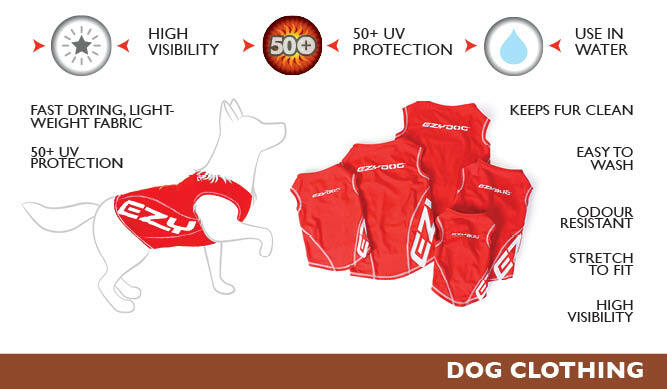 With 50+ UV sun protection, the EzyDog Dog Rash Shirt is the perfect beach accessory. For best fit measure the length of the dog. This is the area from the dogs neck to the base of his/her tail. "We received our rashie last week but with this hot weather it is great for our little 9 year old Maltese little dog . She can wear the rashie and sun hat down by the river on her walk and in the river to. And she will be safer from the sun so thank you, she looks great in it, and it fits great to. Thank you "
If you have any record of best fit for a whippet I’d really appreciate knowing before I order another please. I’m thinking maybe an M would be better. Length neck to tail hasn’t produced best fit for this fella. Thankyou." "I have a white boxer and we live at the beach. Not only does this protect her from sunburn but I can clearly see her in the surf and on the sand (she tends to blend in otherwise!) We have had lots of comments about what a great idea it is and also on how cute she looks :) She is very comfortable in the shirt and it is lasting really well. Another fantastic product from Ezydog!"